Brazil's former Manchester City defender Maicon has been dropped from the national squad due to a serious breach of discipline. 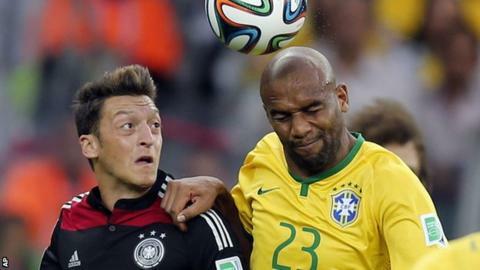 The five-time World Cup winners are preparing for a friendly against Ecuador in New York on Tuesday. But Roma's right-back Maicon, 33, who has 76 caps, will take no part in new manager Dunga's second game in charge. Maicon played the full match as Brazil won their first game under Dunga 1-0 against Colombia in Miami on Saturday. He joined Manchester City from Inter Milan in August 2012 for a reported £3m fee but failed to impress in his only season in the Premier League. He completed a move to Italian side Roma for an undisclosed fee in July 2013 after making just nine top-flight appearances for City. Can Dunga rebuild humbled Brazil?